One of the key things to remember is keeping it simple, particularly when starting out. Kanban boards can become extremely complex with many columns, queues and types of activities. Someone should be able to look at the board for only a few seconds and get a quick sense of status. If you have to think about it too much, the board is likely to be too complex. Thanks for your comment. I totally agree. It’s surprising how many complex Kanban boards you see out there. We found real benefit in keeping it as simple as possible initially and now the team are comfortable with the method they are making suggestions and some improvements are being applied. A complex board would have been much harder to implement. The tool that meets your definition of “ideal” is Eylean Board – a virtual task board that can be fully configured to meet your current needs, the whole tool is multi-touch optimized and can be used as a replacement of a regular white board. 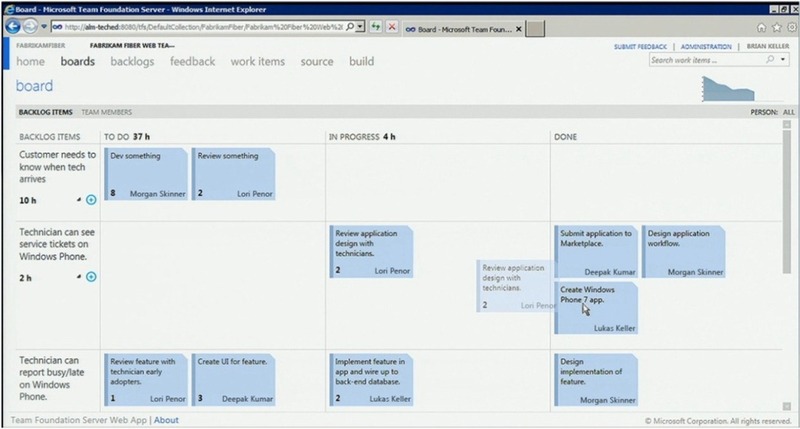 What is more, it has TFS integration, so TFS users can also apply Kanban process and manage their projects visually. automatically-generated metrics like breakdown chart, lead and cycle time. Furthermore, they are convenient for large and distributed teams and they have no space constrains. I use a virtual board to collaborate with my team, but also I use it to organize my private life (a mobile app is very helpful in this case). I recommend you my favorite online: http://kanbantool.com/. Good points Jasper. I think virtual boards offer significant benefits although a physical board is a good starting point if your team is located together. Thanks for your comment.